Inder Loves Folk Art: Pina Dress. There are several ways to cope with sewing failure. One is to throw the crappy item into a closet and take a couple days' (hopefully not years') break from sewing. Another is to immediately start a new project, in the hopes of quickly replacing bad sewing memories with good ones. After my struggles with the ring sling, I seriously considered the former, but opted to try the latter instead. After all, I've been on a major sewing roll lately, and without a project in the works, I'm not quite sure what to do with myself on a weekend. So yesterday, I cut out and sewed Megan Nielsen's Pina Dress in a coral cotton knit that I got at deep discount because of some sun-fading (which ended up being pretty difficult to work around, so I guess you get what you pay for). So here it is! Let's talk about the great things first: This is a really cute pattern, pretty easy to put together, and makes a great nursing top/dress to wear over a nursing tank. This bright coral I chose/dug out of the bargain bin is a bit more saturated than the colors I usually wear, but I like it! Okay, now the nitpicking. It's a little too small! Especially in the bust, but it's also a bit snug in the belly. 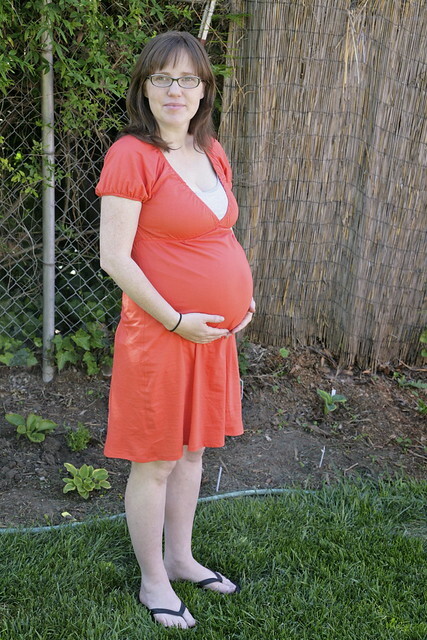 I cut this out in a size Medium, which was perfect for the Ruched Maternity Tee, but for this dress, I clearly need a size Large to accommodate my currently ... ahem, abundant state. Because, uh, I'm not going to be getting any smaller over the next nine to eleven weeks. Squinting at the beautiful sunlight! In another couple of weeks, this will officially be too small. And because it's so snug, it's also not the most flattering piece of clothing I have worn. This thin jersey is a bit sheer and clings in all of the wrong places. Without going into too much detail, we're talking VPL City from behind. Not cool. Definitely not work-appropriate. The good news is that my current state is a temporary one. This will probably fit better after I have this baby. I know my nursing tanks will! And who knows - without the giant belly, the skirt may skim my curves rather than clinging to every little thing. Right now, I think this would probably be more flattering as a top, rather than a dress. But I haven't given up on it as a nursing dress, so I am loathe to lop off a foot and a half to make a top that will only fit me for a few weeks longer look better in the short term. So I may just wear it as a nightie for now. That sounds like an admission of failure, but actually, this is a really cute, cheerful, colorful, and comfortable maternity nightie, and it will make an excellent nursing-friendly nightie - the kind of thing I practically lived in during my early postpartum period after Joe was born. A decent nursing nightie is practically a wardrobe staple for the new mom. If I make this again (and I might! especially as a nursing dress, rather than a maternity dress), I will definitely size it up, especially in the bust (which is also, ahem, not going to be getting any smaller over the next couple of months), and use a heavier knit that won't show every lump and bump. 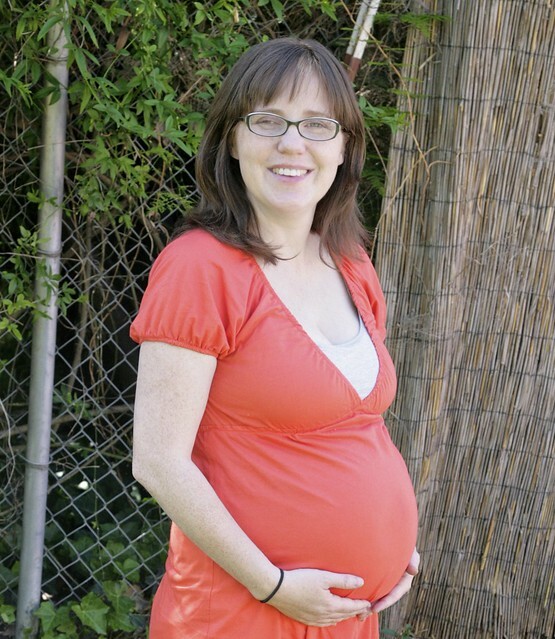 Meanwhile, I've already cut out another Ruched Maternity Tee using this coral knit (I'm getting a workout trying to salvage this faded yardage, for sure!). The lightweight knit will be perfect for a t-shirt, and I know that the style flatters me right now. With that, I'll leave you with the most epic dining room train track set-up ever. Harpal and Joe worked on this yesterday, and I've been stepping around it for two days, because it is just that cool. 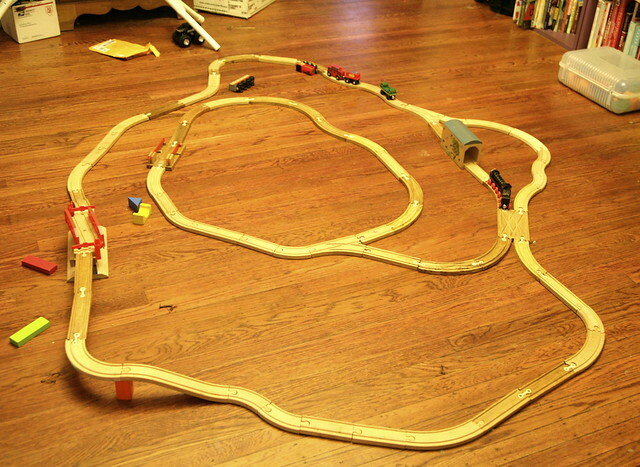 Special thanks goes to my mom, who found Joe a huge box of track at a yard sale and gave it to him for his birthday. I'll probably never be able to walk across my house in a straight line again, but Joe is seriously loving his gift. Tunnels, bridges, and loops: These are a few of Joe's favorite things. Cute as pie! Oh and the dress is nice too. Tee hee. Shame about the size thing...I know I always find it so hard to pick a size for sewing adult clothes. From the pics though it looks great on you and I love the bright color. And it's especially nice that you'll be able to wear it both before and after your little one is born. Yeah, there's a reason I didn't publish a photo of the back view ... I am hoping that I'll be get plenty of use out of it anyway! Looks fab - thrash it to death for the next couple of weeks and then again post-partum! The style is great on you so I think you owe yourself another in the next size to see you through the rest of pregnancy. I love that those wooden train tracks are kind of universal. I bought a stack of secondhand track and trains from eBay and we have the same sort of tunnel and crossing! Hmmm ... you may be right about doing a larger size! Maybe if I find the perfect fabric ... mua-ha-ha. The secondhand tracks are awesome! They've really expanded the awesome track configuration creating potential! It will definitely be nice to have a nursing nightgown, and you can always change it into a top later. And when you get your post-maternity shape it may fit in a way you like better. The color looks great on you! Oh, and the train track is fantastic... Talk about a yard sale score! Yeah, if I'm still not happy with how it clings to my lower half after I have this baby, I will definitely cut it into a top, because it is a really cute nursing style, especially for the time when I'll be living in nursing tanks anyway. Yeah, the box of tracks was enormous too! Major score, mom! I love that color on you! It is bright but its so happy and summery. I agree it looks like it would be great for postpartum nursing and it looks cool and comfortable. And that train setup is spectacular! Thanks! I had my colors "done" when I was a teenager, and I was found to be a "spring," with this sort of color being one of my best. But in real life, I tend to favor darker, more "autumn" tones. I may have to bring more beautiful spring tones back into my wardrobe, though! I think your dress is beautiful, and the color looks great on you! It's so hard to figure out what to sew when you're in your third trimester and your body changes almost daily, but your dress is perfect. Doesn't look too small from your pics... flaunt that awesome belly! Thanks! Yes, the constantly morphing shape does present some challenges, although using very stretchy fabrics helps! I have mixed thoughts on that thin knit stuff. I think your dress really suits you and looks great, but I'm looking at it feeling relieved I wasn't the one to sew it up! Not sure I've really mastered knits yet, but you obviously have. So well done you! This knit, being mostly cotton, was pretty easy to work with. The rayon knits I've been sewing with are much more squirrely and challenging. That said, this pattern calls for a lot of stretching AND sewing, at once, and that is a challenge! I've now trained my brother to help me pin the elastic before starting. It requires more than two hands! Great to hear you got straight back to the sewing and I'm sure you'll sort out the sling after a bit of a break from it. The dress looks great and it'll be so useful as a nursing dress. Also, you'll be able to whip the next one up even quicker. Did you get my email? I did! And I just sent a reply. Sorry for the delay, I caught a cold, and I have been a pathetic sniffling overworked lump all week! Ugh! Sorry to hear you've had such a struggle this week. No problem with the delay, sorry if you thought I was hassling you - I just wanted to make sure it hadn't gone straight into your spam folder. I wish you a much better and healthier week ahead.